What they say: In a universe of capricious gods, dark moons, and kingdoms built on the backs of spaceships, a cursed queen sends her infant daughter away, a jealous uncle steals the throne of Kali from his nephew, and an exiled prince vows to take his crown back. 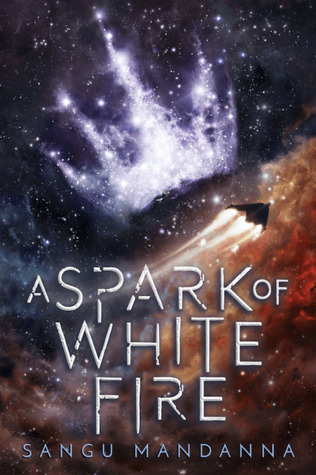 What I say: If Star Wars and Firefly are westerns set in space then A Spark of White Fire is a reworking of Indian mythology set in space. The plot focuses on Esmae, the lost princess of Kali, who is ready to go home and claim her rightful place with her family. We meet Esmae as she prepares to enter the leadership competition where the prize is the ultimate battleship Titania, blessed by the all powerful gods (still with me?). Whoever controls Titania will hold huge power and will become a key player in the civil war for the rulership of Kali. On one side there's the mother who sent her away and her formidable twin Alexi, and on the other, her usurper uncle Elvar and his adopted son and heir Max. What I particularly enjoyed was the political intrigued combined with the mythology. There are a lot of 'greater good' choices to be made. Almost every character seems to be skirting pretty close to moral grey areas, to the point where there's no clear villains or goodies. I liked seeing the different gods and goddesses appear and cause their own brand of mischief and carnage *ahem* general indifference and annoyance over the troubles of mortals. I'm not entirely sure how I felt about the potential romance - I'm sure it won't be for everyone (don't worry no spoilers). The story ends on a huge cliffy so I cannot wait to see what happens next.